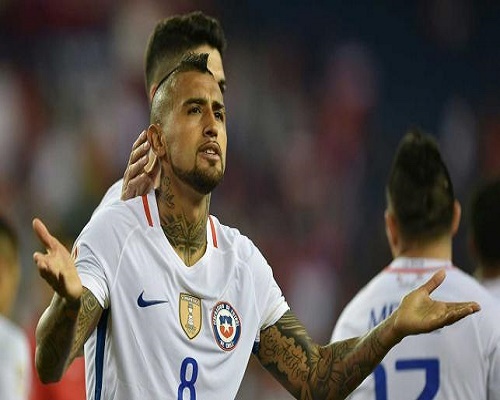 Arturo Vidal scored a controversial penalty deep into injury time as holders Chile snatched a dramatic 2-1 victory over Bolivia to keep their Copa America Centenario campaign alive here Friday. Earlier a stunning 61st minute free-kick from Kuwait-based playmaker Jhasmani Campos appeared to have grabbed a share of the points for Bolivia at Gillette Stadium after Vidal had given Chile the lead just after half-time. Bolivia, beaten by Panama in their first match, have zero points from two games. It looked like being a frustrating evening at Foxborough for the Chileans, who dominated possession and territory but were unable to make their advantage count until the referee’s late intervention. After a scrappy first half, Chile looked to have taken a decisive breakthrough immediately after the restart with Vidal’s goal. Arsenal star Sanchez dispossessed Juan Carols Arce just outside the Bolivia area and fed Mauricio Pinilla. Pinilla looked up and squared for Vidal who swept in an emphatic finish to make it 1-0 on 46 minutes. Yet Bolivia got back on level terms after Chile conceded a free-kick from around 25 meters, slightly out to the right. There appeared to be little danger but Campos stepped up and produced a spectacular long-range strike which curled late before dipping into the top corner beyond the fingertips of Barcelona goalkeeper Claudio Bravo.